Purchasing a boat is a big but worthy investment if you want to take recreational boating seriously. It’s not as easy as it sounds though. You can’t just pick any boat that you fancy, hand over your money to the seller, and then sail away with your new water vessel. You must be very careful in selecting a boat, especially when purchasing a second-hand boat. The first step to finding the best boat for you is to find a vessel that is appropriate for your boating purpose. Do your research on the different types of boats and their usage. After finding the right boat, you need to take the vessel for a test drive or sea trial. It will help guarantee the quality of the boat and ensure that it’s in excellent working condition. We’ve listed the best tips for sea trialling a second-hand boat for those of you who are about to give your prospected boat a test drive. Remember not to waste the opportunity because this is your chance to evaluate the boat’s performance before you purchase it. 1. Before going to your sea trialling, you should already have a pre-trip inspection where all structural aspects of the boat including the engine, wiring, electronics, upholstery, and plumbing are checked. You should also be aware of all the things included in the deal when you purchase the boat. 2. If this is your first time purchasing a boat, you should take an experienced boat owner with you on the day of your test drive. This will give you an unbiased opinion about the boat. 3. Have your family with you during the sea trialling, especially if you are purchasing a family boat. They can give you good advice from a passengers’ point of view and can help you with your final decision in purchasing the vessel. 4. Meet the seller a few kilometres away from the boat ramp so you can see for yourself how the boat is when under tow. This is important, especially if you’re purchasing the trailer as well. Make sure that boat sits well and secured on the trailer. If possible, ask the seller if you can tow the trailer with the boat using your own car so you can feel if the combination of the three feels right. 5. While launching, note how easy or difficult it is to launch the boat. Check for any signs of bearing or brake issues. Check if the safety chains and shackles are still in excellent form. Ask if there is any safety check needed before launching the boat. Also, make sure that the engine starts easily. Some engines, especially the old ones, need fuel to be pumped into the system in order to start. Check if this is something that applies to the boat. 6. If the boat ramp is not busy and there is no one in the queue, try to launch the boat yourself. Ask the seller for advice on how to manage the launch. Make sure that this task will not prevent you from enjoying the boat. 7. Make sure to test drive the boat the way you will use it once the purchase is complete. One of the best tips in sea trialling is to do it during a windy day, so you can fully evaluate its capability. All boats work fine in a calm water, even used boats. It’s much better if there is 15-20 knots of wind and up to a metre of wind chop, to find out if the boat can handle these conditions. 8. Let the seller demonstrate the capabilities of the boat first. This way, you can ask to explain the boat’s controls, instrumentation, and use of safety equipment. Keep an eye on the oil status, water pressure and engine temperature to find out any irregularities. 9. Observe the noise and vibration of the boat. You, the seller and your family should be able to talk just fine. The ride should feel smooth from anywhere you are sitting on the boat. Check if the engine is well suited for the boat. 10. Once you behind the wheels, make sure that you feel comfortable with everything. Check if the seats have enough back support, if you can easily reach the controls, and if you can clearly see the water when moving. Don’t forget to check if the gauges are within your eye of sight as the driver. Assess the steering wheel. It should feel at ease in your hands no matter what speed the boat is in. 11. Try to drive in various trim settings and speed. Accelerate the engine and bring the boat onto a plane. Check that the boat does not rise and fall (porpoise) and tip from side to side (chine-walk) at high speed. Also, make sure that the bow rise does not hinder forward visibility. 12. Run with the waves and run against it. Make some easy turns and sharper turns. Also, see how stable the boat is while the engine is at rest. Stop for a while and shut the engine down. Feel the stability of the boat when it is idle. Then, restart the engine. It should be quiet and smooth after the engine is warmed up. Try reverse and try manoeuvring at low speeds. The boat should run smoothly at any given instance. If there is something that you want to try but the seller does not permit so, ask him to do it instead. The important thing is you are able to test the boat, as thoroughly as you can. When you are satisfied with your sea trialling, then you can proceed with the purchase happily and without any reservations. For any financing help that you need in purchasing new or used boat, you can call us at BoatFinance.com.au on 1300 880 883. Better yet, get a pre-approved boat loan prior to your sea trialling so you are confident that you have the resources for your prospected water vessel. If your sea trial is successful, you should be ready to make a deal on the spot. We offer customised, low interest rate boat loans with fast approvals and whether you are going through a dealer or private sale. 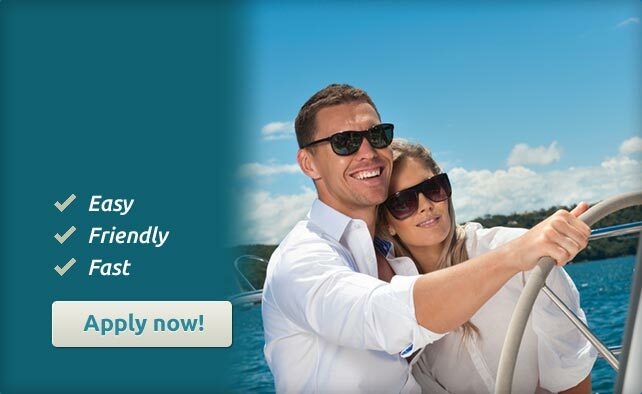 Apply online now for a no obligation pre-approval on your loan so you can be ready to buy if you find the right boat.